What Does Sustainability Mean in Personal Finance? We usually hear the term “sustainability” used in connection with environmental issues. But it is increasingly used as a term in personal finance, and it’s an important idea to consider. Basically, it’s about how your financial decisions are working for you long term. Can you sustain your current spending and saving patterns and still reach your goals? Are you on track in saving for college for your kids? For your retirement? If not, it’s time to adjust your spending. It’s also important to look for ways to bring in more money that can be funneled into your savings. To sustain yourself and your loved ones over time takes flexibility. Change is the one thing you can count on; be ready to adjust. No job is 100% secure any more, so think of what you would do if you lost your current job. Have a Plan B, a Plan C, and a Plan D. While you still have your present job, get extra income with side jobs, hobbies, and selling things on ebay. These streams of income can help in many situations, and the time to perfect the technique is now. Learn new skills and be on the lookout for opportunities for side businesses with low costs to you. Do you have a savings plan that can stay on track in good times and bad? That’s not so easy. Do you have a spending plan (otherwise known as a budget) that is working for you? No? The easiest way to start one is to just write down what you are actually spending for a few months. Then you can take what you spent and put it into categories to see any patterns. You can then see where it’s easier to cut spending. You might see that spending on restaurant meals, entertainment, or clothing could be cut back. One of the easiest ways to save more money is to have it automatically sent to your savings account from your paycheck. That way of “paying yourself first” has been proven to help many people meet their savings goals. When your budget takes a hit from unexpected bills do you have a savings cushion to fall back on? Build your emergency savings account to cover the basics when an emergency hits. I say when, not if, because these things happen to everyone. To not have an emergency fund is to ask for financial problems. The car might need big repairs, medical bills not covered by insurance are common, a family member could need assistance. You could lose your job or have to take a lower-paying job. That’s what an emergency fund is for, to tide you over until more budget adjustments can be made. Speaking of budget adjustments, don’t make cuts only when the budget is tight. Keep looking for ways to reduce your bills even in good times. If you are able to reduce your utility bills, insurance bills, housing costs, etc. that savings will help you in good times and bad. You could put some of those savings into the college fund or retirement fund. If the company you work for offers a 401K, it’s a good idea to put in your money up to the point where the company stops matching your contributions. Even if the funds within the 401K don’t make great gains some years, at least you know you have the company match that doubled your contribution. That’s going to come out as a fairly high “interest rate” return on your investment since you start out with 100% “interest.” You might not have doubled your money by the time you are allowed to take it out, but it’s going to be a lot higher than what you could make on any other investment, unless you are some kind of investing genius. “If you are counting on a paycheck from your job to finance your expenses, you should put some thought into where your job ranks in terms of sustainability. Are your skills likely to be in demand five years from now? 10? 15? Is your present employer stable? If not, are your skills easily transferable to another employer? Could you earn an equal or greater paycheck if you changed jobs? Make an action plan to protect you and your family over the long term. Just list the things you want to do or investigate further. Then check them off as you do them. If you keep at it you will have put in place a very good sustainability plan for your financial future! 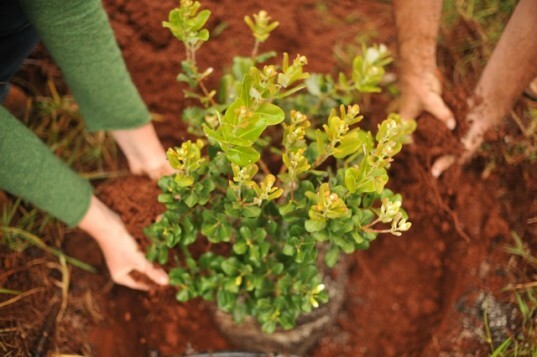 By the way, I chose the above photo because it shows an action: planting a healthy bush for the future. I could have chosen a beautiful green landscape photo with everything in serene harmony. That’s just not the way it usually works in financial planning. While you may have a beautiful plan, things keep changing and you need to keep taking action to make things happen for the future, like planting a tree that will grow and eventually bear fruit. Only it’s better to plant many trees and bushes that can bear fruit at various times along the way! Click on any of the labels below for more tips, especially the label “car insurance” because it’s one area that’s can reap big savings. Yes, increasing our skills keeps us more flexible in case we need a new job. Thanks for your comment, Parvinder. Thanks Maggie for sharing this great post. I’m agree with you that no work post is 100% secure… we should continuously improve our earning skills. It becomes more important now than ever. Another important point that I like the most is : creating an emergency fund. i think you are right dear. Thank, Miss T! For sure we need to sustain our financial future! Thanks again! Awesome parallel Maggie. You are right. Just like we need to sustain the planet we also need to sustain our financial future. Very well explained. Thanks very much, Joe. It resonates with me more and more these days. Do you know how some days a concept hits you the right way? Finally, the concept of sustainability in financial planning resonates, where I must admit, I had some pretty deaf ears in the past. I think it’s that I’ve never considered “what it means” as I gloss over it….cool stuff.